As I’ve said or written many times, if you look at all the factors closely, solar energy, wind energy, electric cars, and other clean technologies are already better consumer options than the dirty norms we are used to — not even considering the broad societal benefits of stopping global warming and cutting air and water pollution. But until this is the case for everyone and is also obvious to everyone, we have work to do. On the cost side of things, one sensible solution would be to pull subsidies from these overripe fossil fuel industries. Unfortunately, pulling subsidies is one of the hardest things for politicians to make themselves do — especially when they get millions of dollars from the industries those subsidies support. On the flip side, some politicians and governments have tried subsidizing cleaner options, but these efforts are limited in scale and scope, come with their own political challenges, and do not adequately compensate for externalities of fossil fuels, let alone the externalities plus the many institutionalized fossil fuel subsidies. One “clean” solution is simply putting a price on carbon pollution. Of course, any carbon pricing policy has to get the backing of a broad range of politicians, and while “simply” may not be the correct word, it is still within the realm of possibility. One nonprofit focused on the hard, time-consuming, and critically important legwork to make this happen is Climate XChange*. Based in Massachusetts and blessed with a more progressive populace than the average state, the people leading Climate XChange believe that they can make Massachusetts a carbon pricing leader, and then use that success to grow the cause in other states, nationwide, and perhaps to other nations. In particular, Climate XChange is pushing for two carbon pricing bills that are currently pending in the State House. In other words, consumers don’t get hit with higher overall costs with such a program (they get cash back) — but pollution is still discouraged by making fossil fueled technologies less competitive than clean technologies. 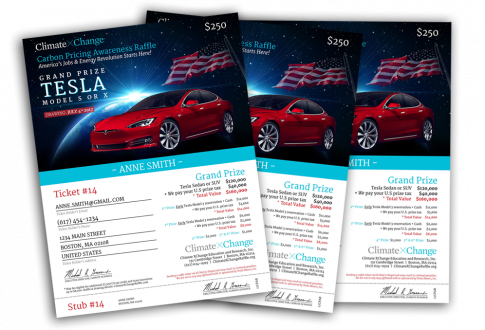 Grand Prize: an awesome Tesla Model S sedan or Model X SUV @ $120,000 PLUS Climate XChange pays the federal income tax of $40,000 for your prize, so you don’t have to! In other words, the grand prize is worth a jaw-dropping $160,000. Amazing 2nd & 3rd prizes: Climate XChange helps you buy an early Tesla Model 3, with a reservation, deposit, cash, and a federal income tax payment! You do have to be a United States resident to win, but not to donate to the organization!